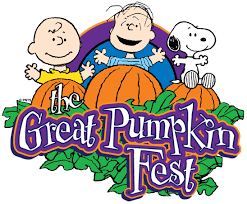 Welcome to Planet Snoopy - home of the "scare-free" celebration known as The Great Pumpkin Fest. Just in case you didn't know what the festival is called, there are lots of banners to remind you. I really liked the photo op in the center of the land. Very cool looking doghouse. I really liked this pumpkin arch. I think they could have a few more of them in the area. They had a "Pick-a-Pumpkin" patch for the younger guests. There was also a pretty good hay bale maze on the former Scrambler ride pad. They had Halloween flags flying around the land. The "Trick-or-Treat" houses are a lot more elaborate this year. Inside Peanuts Playhouse they have dance parties and crafts. Pretty cool event for the younger guests.